PMBOK describes the meaning of “Historical Informations” as: Documents and data on prior projects including project files, records, corespondence, closed contracts, and closed projects. Systematic management of projects, programs and portfolios in allignment of the strategic goals. OPM3 by PMI will help to increase organizational project management maturity to plan improvements It is based on a set of best practices OPM is based on the idea that there is a correlation between an organiszation´s capabilities in project management, program management and portfolio management and its effectiveness in implementing strategy. Based on 586 Best practices and 2109 capabilities. 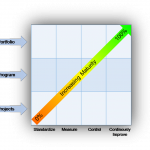 Project Management Maturity Model (PMMM) Das PMMM ist angelehnt an das CMMI-Model der Universität Carnegy Mellon und beschreibt in fünf Stufen den PM-Reifegrad eines Unternehmens. Pyramid Project has decided to use CMS (WordPress) as the favourite tool for webdesign of www.pyramid-projects.com. Thanks to Mampfi and Tommy who have given support.